Bizarre guess on ITV game show. 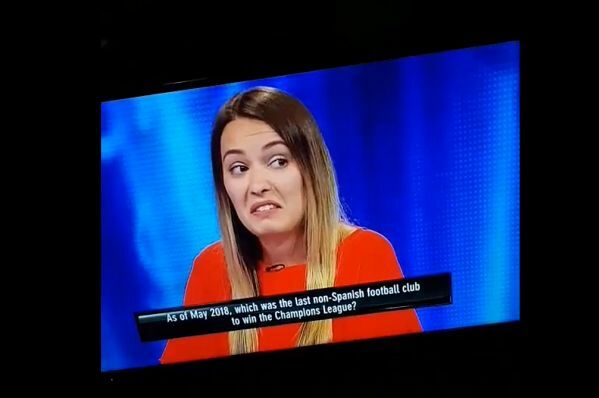 A contestant on ITV’s daytime game show Tipping Point answered Czech Republic as the last non-Spanish team to win the Champions League. Looking distinctly unsure of herself, the woman gives a reply that could surely not have been anything other than a wild guess. As of May 2018, which was the last non-Spanish football club to win the Champions League? She says Czech Republic as it was the “only one coming to [her] head”, with host Ben Shephard asking her if that’s her final answer. As an avid football fan himself, Shephard will no doubt have been aware of all sorts of flaws in her response.